Due to low usage this forum will shortly be taken offline. Thanks to all those who have contributed. I was surprised to come across this poster. An arms distance away can still be too close, particulalry for large vehicles. Does anyone know of a poster that can conveys this message in a better way? Sadly not. Even after a search online the best I could find was this... and it's from 1986! @JoeSoap76 it seems like there's a paradox of trying to be specific but also general enough to cover different situations. Bez has written about this sort of problem faced by Police when implementing WMP's Operation Close Pass, specifically the educational mat they're using. It seems that a simple mat detailing passing distances is not enough on its own but requires skilled officers to demonstrate different road positions and explain why people cycle where they do, and so the matt is just a prop. This leaves me thinking that any poster is going to struggle and so it would be good if they bring Operation Close Pass to Glasgow, the way it was intended. @un I'd missed that post from Bez. Have to admit that when I saw the Kickstarter for the mats I had the same concern about the markings; wish I'd seen his post earlier for some perspective. Not a poster but a video. "Overtaking is the most dangerous driving manoeuvre" - perhaps for Drivers but I thought for cyclists it was SMIDSY at junctions? 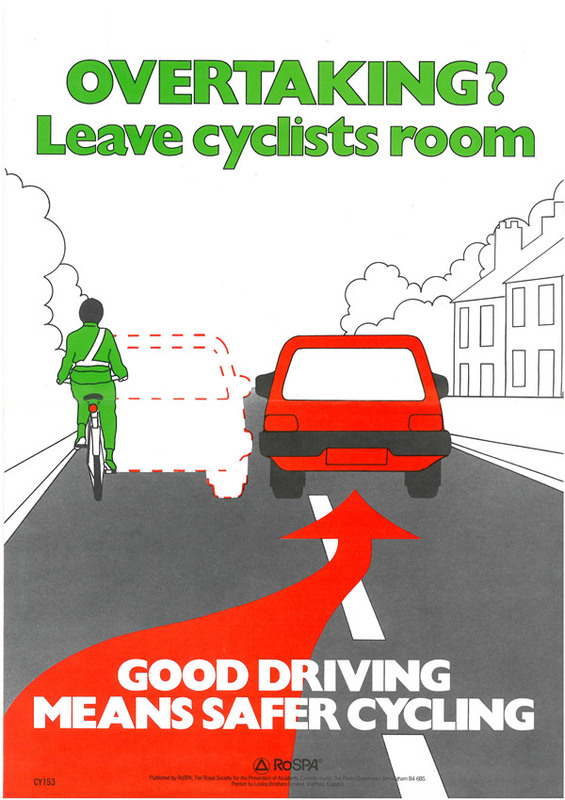 @JoeSoap76 if Operation Close Pass happened in Glasgow then we could have posters promoting it instead of the current "Give me Space". Perhaps this new poster could have a new message: "Give me space or get nicked". @un "at least as much space as you give a police officer"